Lori's Busy Life: Wednesday Medley- NATIONAL PIE DAY!!! 1. Okay, fess up. Tell us your top three favorite pies, please. Will you have some pie today? Oh how I LOVE pie!!!! My favorites are Coconut Cream, Chocolate and Pumpkin...but I like lots more. Pie is my favorite dessert! 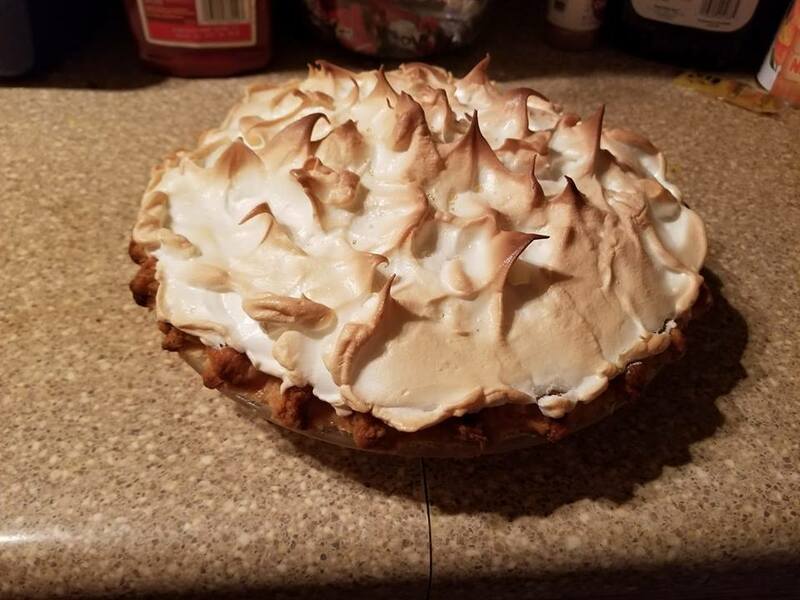 This is a coconut cream pie my mom made me for my birthday last year! It was so good! I actually DID get some pie today! Our school recognized National Pie Day and made us Chocolate pie. What a treat! 2. While we are talking about food... are you a picky eater or are you ready to try almost any new food? What is the worst thing you have ever eaten? I am a little picky, but I am always willing to try things with my co-workers. Oh the worst thing...Maybe something slimy? I have put it out of my mind. 3. Baking could be considered an art as could cooking. How do you define art? I agree that baking and cooking is an art. I feel like art is a way of expressing yourself and practicing your skill. 5. January 23rd is also National Handwriting Day. Do you have nice handwriting? 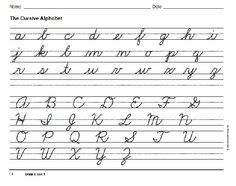 Did cursive writing come naturally or did you practice in those double-lined practice books until your fingers hurt? I think my handwriting is awful, but people tell me it is good and ask me to write and make things using my handwriting. I am at an age where we did practice handwriting using those practice books. I had heard handwriting was going to be taught in schools again. Good idea since my son was not even able to sign his drivers license in cursive. I had to re-teach him how to write in cursive. There are lots of documents you have to sign and then print. 6. Tell us something random about your week. We are having Chinese food for dinner. I am pretty excited about that! I always have General Chicken, egg rolls and crab rangoon. Yum!! I love Chinese food too! Coconut custard is my favorite pie but I also love coconut cream! Your joke is very cute!! Thanks for joining in today! Your joke was cute, the faces on the dogs were hilarious! Enjoyed your answers!! Pie is my very favorite dessert as well. And, I love Egg Rolls and haven't had one in a very long time. Happy mid-week! General Chicken is my absolute favorite!!! What s riot about your son signing his drivers license! I’ve heard that so much!! Have a wonderful week, dear Lori!! I love Chinese food as well. Haven't had any in a while. Maybe it's time. We don't have a take out place very close to us, as we live in the forest, and the nearest Chinese place is about 30 miles from here. So I guess that is why we haven't had it for a while. Now I'm wanting a crap rangoon. I love those, and egg rolls or spring rolls...okay, that may have to be our Friday night dinner....somehow we'll get there and get it! Have a blessed day. Thank you for visiting my blog today. It is nice to get acquainted. 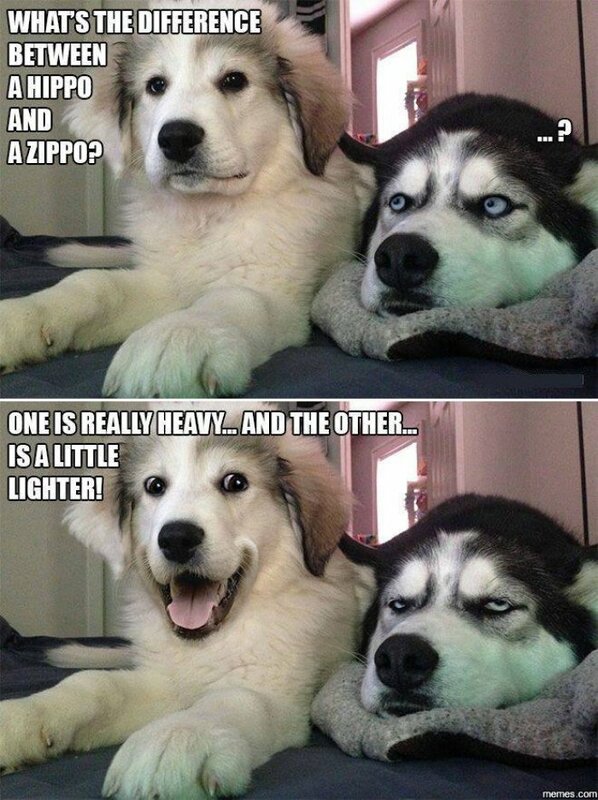 I love ALLLLLL the jokes with those two dogs. The faces are so stinkin' cute! Hooray for Chinese food! I love it and I love getting take out on a work night so I don't have to cook...a double treat! How many times did Mary Ann make coconut cream pies on Gilligan's Island? Went to the hotel restaurant for supper in a rural town after attending a seminar. The dessert choices were choco pudding with a shot of Reddi Wip or red Jell-O cut into cubes in a parfait glass and a shot of Reddi Wip. Might have been Cool Whip. Or coconut cream pie. Natch I chose the pie. You dinner sounds really good. I love crab Rangoon. I said chocolate and coconut cream pie too. Yum! You joke made me laugh. Pie is my favorite dessert, too! That dog meme is just precious! I've not enjoyed Chinese food in months and months. Usually I get the beef and broccoli, but I'm going to investigoogle "what is General Chicken." Have a great day, Lori! There is a Chinese place less than half a mile from my new house and I keep meaning to order!